Thesis by Australian student Senthorun Sunil Raj. It won the 2011 honours thesis prize from The Australian Lesbian and Gay Archives (ALGA). 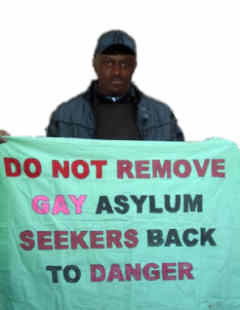 "Validating asylum claims on the basis of a person’s sexual orientation rely on discerning what constitutes sexuality and a ‘well founded fear’ of persecution. However, the way these questions assume relevance and are interpreted in asylum law is fraught with epistemological challenges. Authenticating refugees on the basis of sexuality relies on suturing narratives of ‘functioning’ sexuality as causally related to specific incidents of persecution. Emotion, desire and feeling are obscured by a culturally coded administrative method of verification, a narrative process which produces a caricatured, ethnocentric and over determined legal trope of the gay or lesbian asylum seeker. Refugee subjectivity becomes mute within the colonising space in which it seeks asylum. Responding to this, my thesis will examine how and why the queer refugee remains grounded in these narratives of fixed identity." "Moving beyond such a parochial legal imaginary, I will consider the possibilities of conceiving queer refugee experiences through relational representations and affect. Developing the scope of current debates in asylum law, my thesis will revise how the queer refugee body is constructed in legal and administrative narratives. Using the trope of the ‘queer refugee body’, I reconsider the causal relationship between sexual subjectivity and persecution." analytic term to encompass bodies that experience persecution framed in terms of their (perceived) ‘queerness’. Queerness as it relates to refugees is not necessarily confined to a universal or fixed sexual identity or identification. Rather, representations of the queer refugee subject must focus on how an asylum seeker experiences and negotiates sexual attachments, spaces, emotions, displacements and violence in both relational and affective terms."